Although it’s a blessing to have so much snow after the consecutive years of drought (since 2010/2011 ski season), the copious amounts of snow have also brought the Town of Mammoth with the issues of dealing with too much snow all at once. 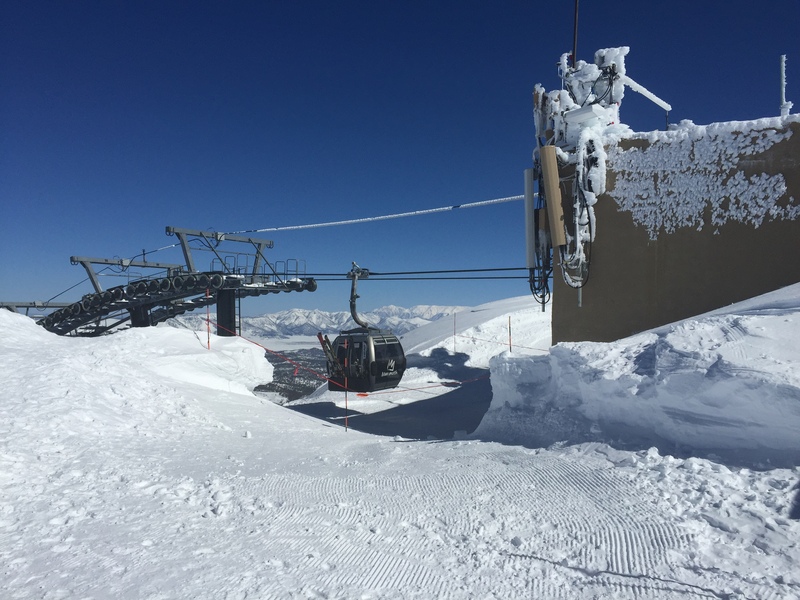 Although many of the storms have brought feet of snow, some of the storms were above freezing, which brought several inches of rain (on top of the feet of snow) to Mammoth. This created flooding issues in various complexes around town. The roads took quite a bit of work to get caught up with snow removal after the powerful series of storms in January that brought feet of snow to Mammoth, but everything seems to be under control at the moment. The Town has had to start trucking out piles of snow lining the streets around town to keep the option open for emergency snow storage if these storms continue over the next few weeks. Driving around different parts of town and looking at some of the homes, which haven’t had anyone there probably all winter, have as much as 10+ feet of snow on the roofs. This type of weight will cause damage to roofs and structures. However, with the shortage of snow shovelers around town, many homeowners are forced to wait until there are available shovelers. If and when shovelers can take on more work, I heard the going rate for snow shoveling is anywhere from $40-$70/hour… There is no question that Mammoth Lakes will have a busy summer recovering from all the snow and the maintenance required on roofs, decks, siding and structures in general. Our already expensive contractor labor force will no doubt become even more expensive as contractors will have more work than they know what to do with. As the old saying goes “too much of a good thing” is clearly the case with snow this year. The drought seems to be gone for this year and all we can hope is that we have “normal” years of precipitation in the following years. All of this snow has resulted in record tourism numbers with continuously high occupancy rates for rentals. Despite the difficulty in getting up to Mammoth, the rentals have been very strong. However, this was the trend over the summer too. Seems that the shoulder seasons in Mammoth are disappearing. Tourism is increasing every year for all four seasons and remains consistent. This makes owning rental properties in Mammoth more attractive now than in previous years. Even with the great winter snow, the demand for real estate remains somewhat lukewarm. The condo and single family home inventory has been slowly dissipating over the past few weeks. We currently have 99 condos on the market and 41 single family homes. These inventory counts have been pretty typical for this time of year during the past few drought years. Clearly, the ample snow hasn’t made the demand any stronger in Mammoth this year. My assumption is that with the highly publicized political unresent the country is experiencing right now, people are apprehensive about making a discretionary purchase like buying a resort property (or investment property) in Mammoth. Demand should be much higher than it is and some of the properties that have been sitting for months (priced at market value), should have sold a long time ago… If the lending regulations soften to allow for more flexibility in financing a resort purchase (not just in Mammoth but any resort area in the U.S.), this might help strengthen the demand for real estate in Mammoth. There are more lenders who can now finance “condotel”, which is any condo development that has a rental office onsite, but there are no guarantees. I would also guess that the development of the Eagle Lodge is on hold until such regulations and restrictions on resort area lending are loosened. Once loans are possible on any and all condo developments in town despite the “condotel” classification, more than likely, this is when we will see development take off in Mammoth for already approved developments like the Eagle Lodge at the base of Eagle Express, aka “Chair 15”. Since the financial crisis and real estate crash of 2008-2012 (in Mammoth), values continue to remain well below the peak of the market pricing of late 2006. This is very different from what other areas of California have experienced. Mammoth has a lot of catching up to do with some of the coastal communities, which are well in excess of the 2006 real estate market highs. It is my opinion that Mammoth Lakes remains undervalued and prices will eventually increase. The question is when? Could this be your last chance to get in at lower prices with relatively no competition? Contact me with any questions or to schedule a showing appointment and take advantage of these low prices that won’t last forever.